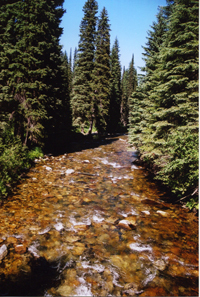 The headwaters of the Selway River are located in the Frank Church – River of No Return Wilderness, before flowing for most of its entirety through the Selway – Bitterroot Wilderness. A large portion of the river is designated Wild, with Recreation designation in places where a road or other development exists. As the premier wild river in the Lower 48, it offers excellent opportunities for solitude and primitive experiences. The headwaters of the Lochsa River, Crooked Fork and Colt Killed Creek, lie deep within the Bitterroot Range along the Idaho/Montana border. 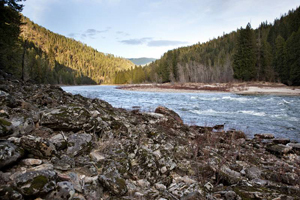 The river is designated Recreation from the Powell Ranger Station, west, to its confluence with the Selway River. The Lochsa provides some of the greatest, and most dangerous, white-water boating in the West, with high waters every spring. 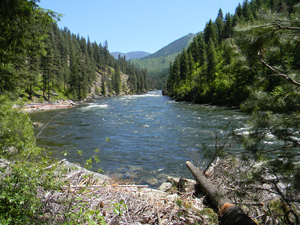 The river provides year-round fishing and wildlife viewing, and offers great access to trailheads leading into the Selway – Bitterroot Wilderness. 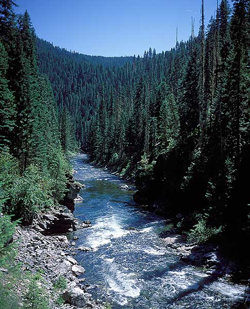 The Middle Fork Clearwater is formed by the confluence of the Selway – Lochsa Rivers. 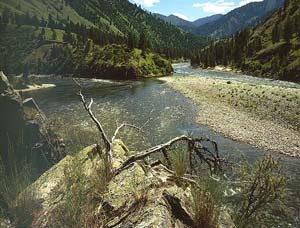 The section of river (Middle Fork) from Lowell, Idaho downstream to Kooskia, Idaho is designated Recreation. The river provides opportunities for year-round boating, and is a premier destination for anglers during steelhead and Chinook salmon runs. Near Lewiston, Idaho the lower Clearwater empties into the Snake River, before joining the Columbia River. Also known as the “River of No Return”, the headwaters of the Salmon River are found in central and eastern Idaho. The Salmon has the longest stretch of free-flowing river (within one state) in the Lower 48. Flowing through one of the deepest gorges on the continent, this magnificent river offers outstanding values of scenery, recreation, geology, botany, fish, wildlife, water quality, and human history. Because of this, Congress has designated portions of the river Wild and Recreation. The headwaters of the St. Joe River are found in the Upper North Fork Roadless Area, which straddles the Idaho/Montana border. From its beginnings at St. Joe Lake, the river is designated Wild for roughly twenty-six miles, and then Recreation, until the river is joined by the North Fork St. Joe River. The river provides important habitat for Westslope – cutthroat and Bull trout, and is a favorite fishing hole of many. There are other bodies of water in the Clearwater Basin that have been studied for designation under the Wild & Scenic Rivers Act but have yet to receive the protection they deserve. This includes John’s Creek, Meadow Creek, Cayuse Creek, Lolo Creek, and the Little North Fork Clearwater. These bodies of water, and others, provide cold and clean water crucial for anadramous fish and other wildlife. Learn more. It is hereby declared to be the policy of the United States that certain selected rivers of the Nation which, with their immediate environments, possess outstandingly remarkable scenic, recreational, geologic, fish and wildlife, historic, cultural, or other similar values, shall be preserved in free-flowing condition, and that they and their immediate environments shall be protected for the benefit and enjoyment of present and future generations. Learn more. Preserving some rivers and their immediate environments in a free-flowing, natural condition contrasts sharply with the dam-building and water-diversion ethos that completely dominated our national river policy up until that time. 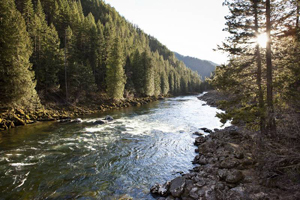 With the establishment of the Wild & Scenic National Rivers System, rivers could be protected as either wild, scenic, or recreational, depending on the degree of development existing at the time of designation. Learn more.